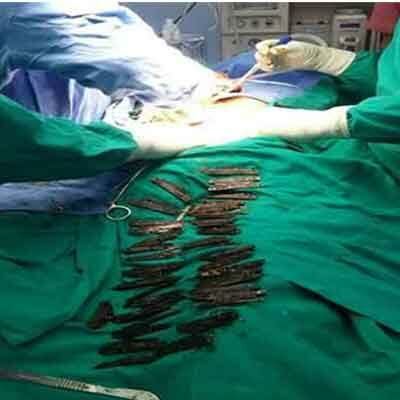 Amritsar : A 42 year old man in Amritsar was operated by a team of doctors in a five-hour long surgery to find 40 knives lying in his stomach. The man was admitted to a hospital in the city complaining of severe pain in his stomach. After a thorough medical examination, it was found that there was a growth in his stomach which was the cause of the insulating pain. The patient was operated and the doctors were stunned to find scores of knives in his stomach. The patient Singh whose name has not been confirmed, had been apparently eating knives since past two months. He confirmed the same stating that he had an obscure urge to eat cutlery blades as he simply liked the way they tasted. Doctors however have confirmed that it was due to some psychological disorder. Dr Jitendra Malhotra, MD of Corporate Hospital, informed the media that the patient, who falls between the age group of 40 to 45, came to them complaining of stomach ache and excessive weight loss. The case was puzzling as after the ultrasound was done, it was revealed that there was some kind of solid mass resting in his stomach which also shaped like cancer. Another biopsy was done and it was revealed that sharp knives-like objects were within. What was astounding was that Singh claimed that he felt healthy after eating them. “He [the patient] says he swallowed some knives folded, and some unfolded. When we took out the knives — some were found folded, some were open, and some had even started rusting and were broken,” Malhotra told CNN. Dr Malhotra added that it was the most shocking case he had seen in the entire history of his 20-years of career. However, after five hours of long surgery, the patient was successfully treated and is set now to be discharged within the next few days. The patient will have to go a psychiatric clearance, sources from the hospital added. Who was the surgeon ??? ?